Law students from the three centers of the Delhi University Law Faculty are staring at an uncertain future. In an unprecedented move, Bar Council of India (BCI), the apex regulatory body for law education and the legal profession in India, has decided to derecognize DU's law course taught at its three centres, namely Campus Law Centre, Law Centre­1 and Law Centre­2. Despite having law degrees they cannot become advocates. This means students admitted in these centres from 2011-12 onwards won't be eligible to be enrolled as advocates and can't practice. In a letter sent to state bar councils accessed by Live Law on September 22, the Bar Council of India (BCI), which regulates legal education in the country, has asked them not to enroll them as advocates as the Law Faculty failed to obtain “extension of approval of affiliation” from BCI despite repeated reminders. “In absence of extension of approval of affiliation of these law centres, the students who were admitted in the sessions 2011-12 onward and passed out from the academic year 2013-14 are not eligible for enrollment as advocates. 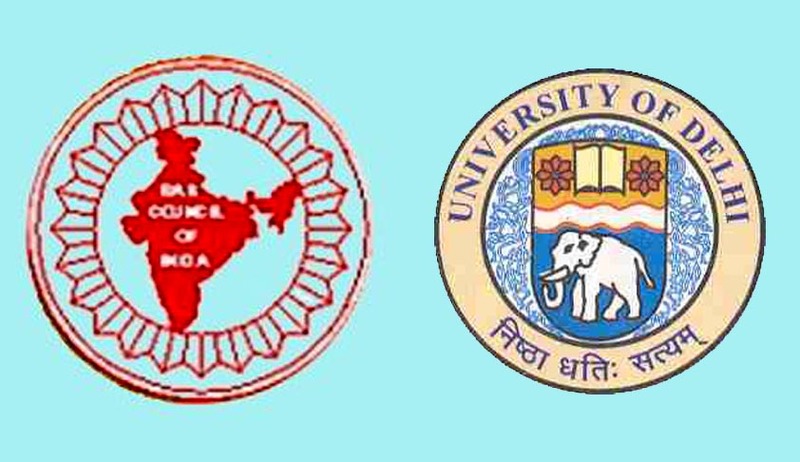 You are therefore advised to take appropriate action with regard to these law centres and inform BCI about steps taken in this regard immediately ,“ the BCI letter to DU says. Many of these candidates who went to the Bar Council of Delhi (BCD) for enrolment returned disappointed on Thursday. The Faculty of Law was established in 1924. The Law Faculty is claimed to be one of the largest law schools in India. Sources in BCI said the regulatory body was forced to act after DU failed to respond to its repeated reminders on extension of affiliation beyond the academic year 2010-11. A communication was sent to the three centres in July 2010 for the first time that DU must seek approval and throw open its centres for BCI’s inspection. “In spite of the said communication the law centres have not applied to the council for extension of approval of affiliation,” BCI has added saying Legal Education Rules 2008 have not been followed by DU, inviting de-recognition. “Yes, we are not giving enrolment to those passed out from Delhi University Law Faculty this year. In view of the BCI resolution, they have become ineligible for enrolment as the Law Faculty failed to obtain extension of approval of affiliation from the BCI to run LL.B. course in its three centres since academic year 2011-12,” BCD Hony. Secretary Puneet Mittal said. BCI decided to amend the rules to ensure periodic inspection of such centres on student intake, infrastructure, facilities and timings. Confirming they have received instructions from BCI, Bar Council of Delhi secretary Punit Mittal said, “Since DU failed to obtain extension of affiliation from academic year 2011-12 onwards therefore the BCI had passed a resolution directing all state BCs including Delhi that candidates from these law centres are not eligible for enrollment. The same applies to candidates joining the law courses 2011-12 onwards”. The law faculty attracts students from every state of India and more than 20 countries of Asia, Europe, America and South Africa. It has over 4000 students and 100 full-time faculty members anytime on its rolls. The alumni of this institution include Judges of the Supreme Court and High Courts, Ministers of Union and State Governments, civil servants, and many of India's lawyers.